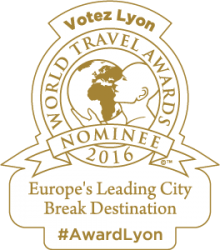 Home > Posts > Agenda > Vote for Lyon, nominated in the World Travel Awards 2016! 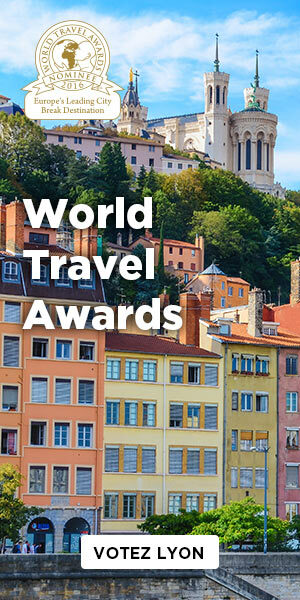 Lyon has been nominated in the category of “Europe’s Leading City Break Destination” in the World Travel Awards. The Metropole de Lyon is in the running along with European capitals and major cities such as Berlin, Madrid, Dublin, Venice, Paris, Lisbon, Athens and London. These awards, dubbed the “Oscars of tourism”, were created in 1993 by the Wall Street Journal, to recognize excellence in tourism. The panel comprises 167,000 travel agents and tourism professionals from around the world, as well as Internet users, who can vote until 17 July to support Lyon. The destination with the most votes is the winner! So start voting! How can you vote for Lyon? The winners for each zone will be announced on 27 August in Antalya, Turkey, and the international finals will be held in December in the Maldives. With this nomination, Lyon confirms its attractiveness for tourists on an international scale. This attractiveness has already been recognized by numerous rankings, as Lyon was ranked France’s leading cultural city (outside of Paris) by the Journal des Arts in 2013, the leading European city for a city break in 2014 by The Telegraph Travel, the 3rd most popular destination for international travelers on TripAdvisor in 2014, as well as the 2nd most popular city for tourists in France, according to the SeLoger.com ranking in early 2016. With 6 million tourists welcomed every year, Lyon is behind Paris (30 million tourists).